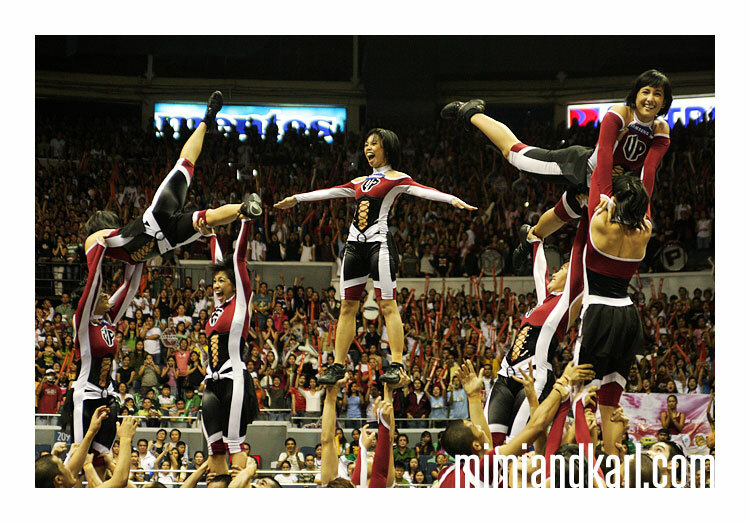 Congratulations to the UP Pep Squad, the 2007 UAAP Cheerdance Competition Champions! I had goosebumps after watching their flawlessly executed routine, I haven’t felt that way since UP won the crown in 2001. This is welcome news after UP’s dismal 0-14 showing this UAAP Men’s Basketball season. 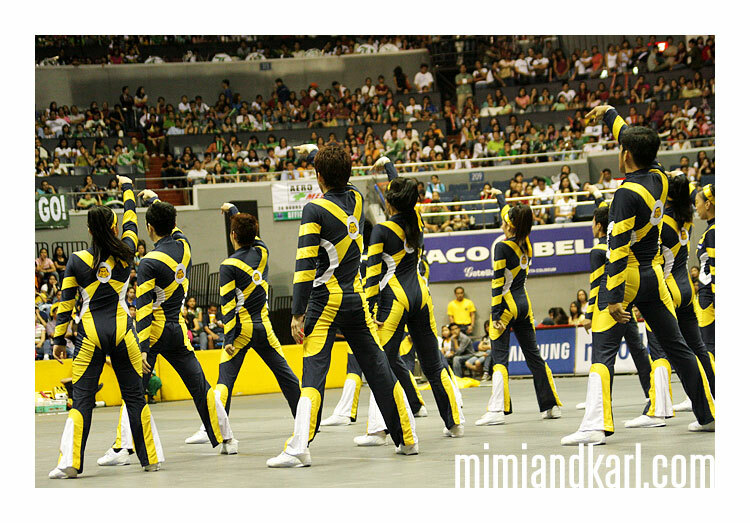 Mimi was able to shoot photos of the cheerdance competition and break in our new Canon 40D. The whole UP community showed up in full force! UP’s theme this year is “Rock” which they incorporated with their costume and hairstyle. The Pep Squad seconds before announcing the winner. A nice gesture from the defending champions. 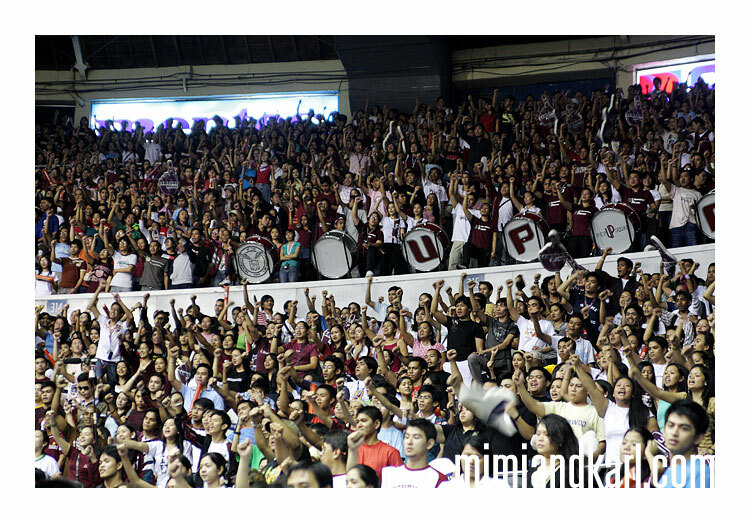 The UP crowd singing “UP Naming Mahal”. UST’s SDT placed second and as usual they were in top form. 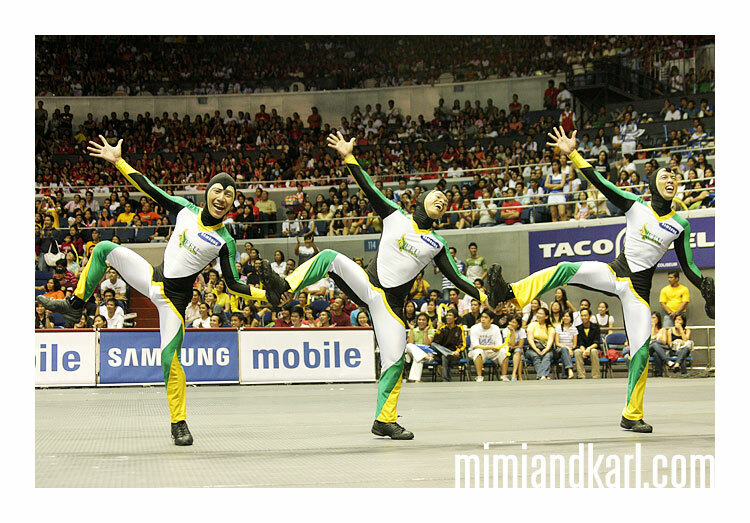 The FEU ‘Penguins’ doing their ‘Happy Feet’ routine. NU Bulldogs in their Cyclops attire. yahoo!!! UP fight!! grabe, of all the years, I had to miss this one! Kahapon pa ako naghahanap ng matinong pics at videos sa Youtube, wala…..thanks mimi!!!! Sana may rerun sa Studio 23! 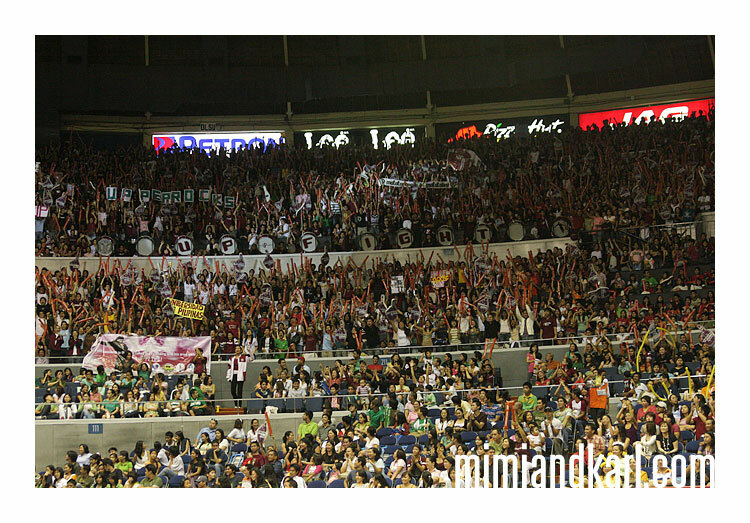 Nakaka panindig balahibo just looking at the pics….so okay lang na olats tayo sa basketball, nakabawi naman sa cheering!! Congrats on the new cam! hi mimi and karl! i always visit your blog because i truly admire your work. 🙂 pero ngayon lang ata ako magpa-paramdam sa inyo. hehehe. 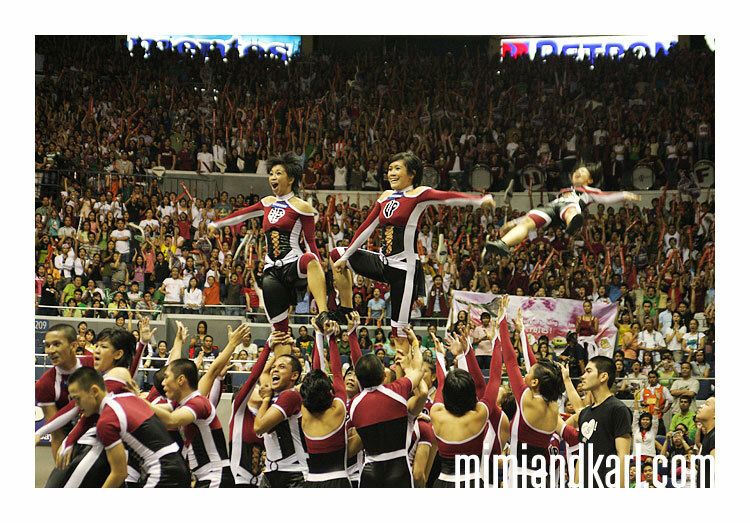 UP PEP SQUAD really rocks!!! i have more faith in them than our basketball team. hahaha. and its about time we end UST’s dominance in the cheerdance competition. it’s UP Pep’s time to shine again. UP FIGHT!!! yehey! 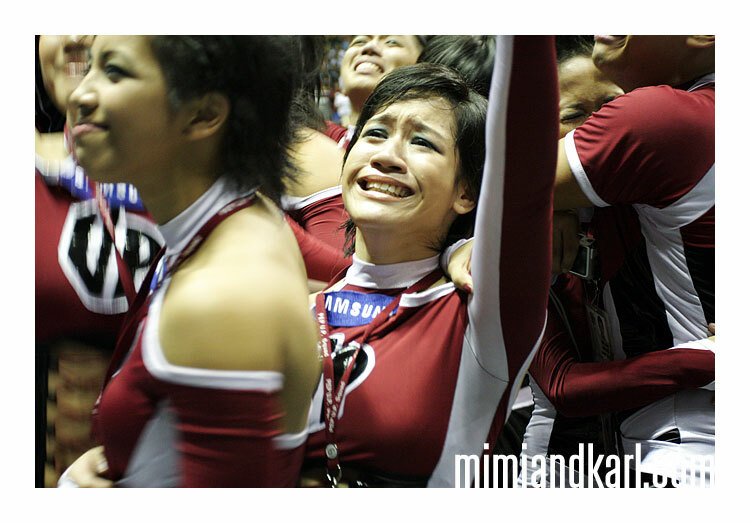 after 20 years of waiting.. champs ulit sa cheerdance ang mga isko at iska! congrats to everyone! my fiancee and i were really looking forward to this. too bad we weren’t able to watch it on tv ‘coz we had to buy our things for our apartment. anyways, at least UP won! yehey! my fiancee told me about mimi&karl. i always visit your site and from the very first time, i was so amazed. galing nyo sobra!! you can really capture that moment in every shoot. how i wish we can have you shoot our photos for our wedding.. (sigh) well, maybe in the future.. keep up the good work guys!! Hi! bought a nikon 40D as well. A newbie in photography, if you will. i wonder if you could share your knowledge…just wanted to know what your camera settings were when you took the action pics. got 2 kids in Pep and i have a lot of pics to take..if you know what i mean. so i need a crash course! hahaha! Thanks! Ask ko lang…how was the Canon 40D? How is it compared to 30D or 5D? great shots! 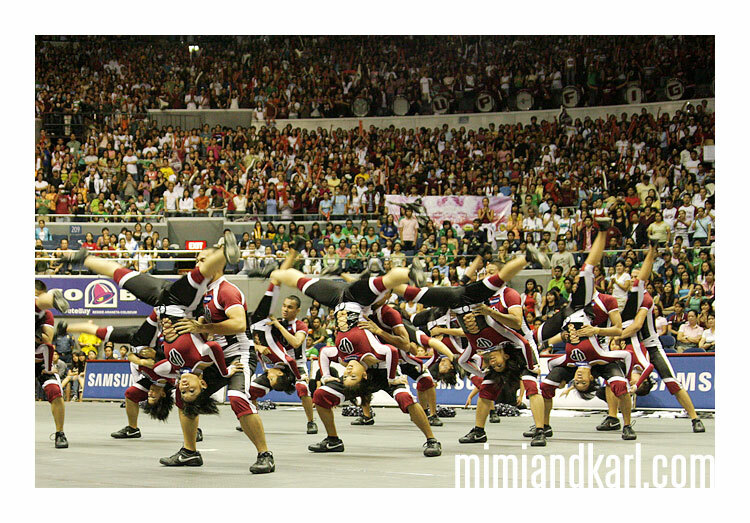 i loved the routine ng UP…sobrang galing! great pics! may kinalaman ba ang experience sa zs pubcom para makapagkuha ng ganyan pictures? hehe. very happy to see UP rocked! Karl, oo na bago camera mo… di ka man lang nagtawag. =( great pics. gumamit ka ng Peyups id? Amazing photos!!!! Ang saya po! Wow, nice pics! Buti na lang nanalo tayo this year, para may iba namang pag-uusapan, hindi lang yung 0-14 ng men’s basketball. Hehehe. mimi/karl pwede pa-copy ng isang pic lang? lagay ko lang sa blog 😀 thanks! sAna sA su2nOd talUnin niO pa Sila!!!!!!!!!!!!!!!!! U-nibersidad ng Pilipinas! U-nibersidad ng Pilipinas! 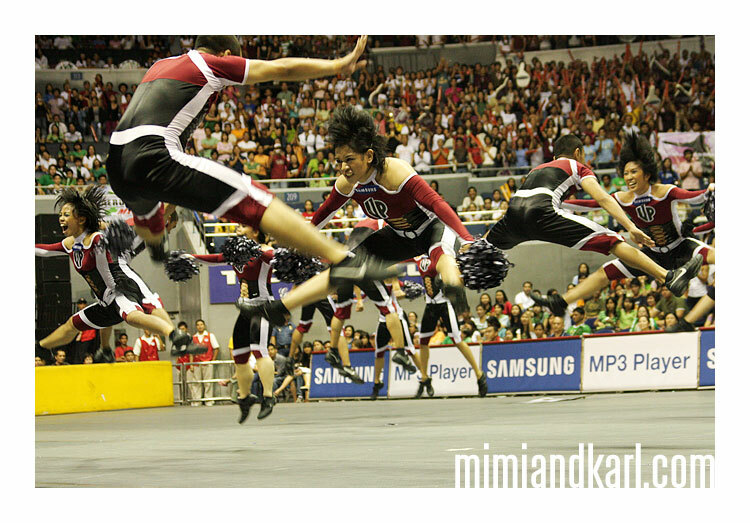 I was actually looking for pictures here nung Monday pa coz I saw from the UP pep squad website yung pictures nila courtesy of Mimi. UP Fight!!!! Galing galing talaga! Great pics. I finally saw what the fuss was all about the school named Al Salle. Hehehe. Dax: sakit ng kamay ko at isa lang dala namin cam, mas masaya pati magcheer. Hanapin mo ko dito. Pa-grab naman ng pics o? Lagay ko lang sa multiply site and friendster ko? Thanks! @ Farah – Uy, long time ah. Sige, go ahead and grab! hi mimi! batch 99 ako. naaaliw lang talaga ako sa mga kuha niyo. lalo na ung shots sa ating eberdirest UPIS. sana abutan ko yun bago sya gibain. gusto ko din pakuha dun. pero pag dko kayo afford, irrent ko nalang cliquebooth niyo. May archive ba kayo ng pics from as early as 1999? Hehehe… Baka sakali nakuhana niyo kami ng pics na nuon. We have a project in our Journalism class wherein we’re required to publish a mini newspaper. 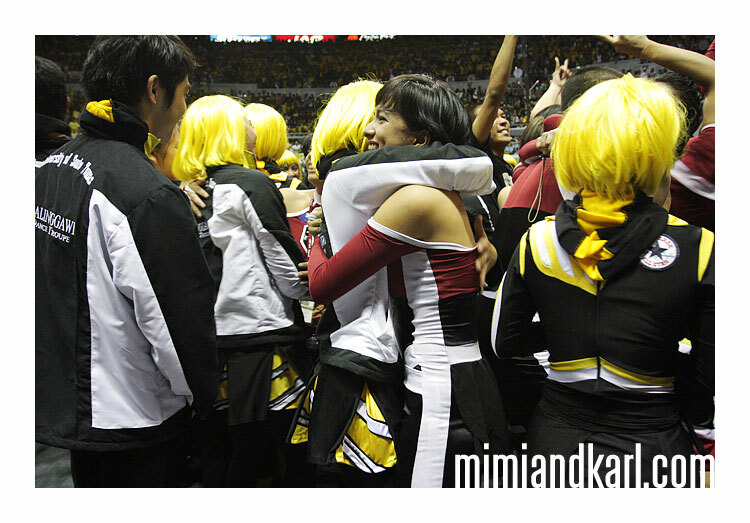 I was just wondering if I could use some of your 2007 Cheerdance Competition photos? We’ll cite you as our source. waaaaaaaa.. kahit di ako UPinians.. still UP rocks…. weeeeeeeee.. hanep! Our class has a project in our Sportswriting class wherein we’re required to publish a sports newspaper/magazine on the UAAP event. Can we use some of your 2007 Cheerdance Competition photos? You and your site will be cited, of course. Its good that UP won! I hope it will win again in this season!!!!! wowow grbe ganda ng up galing ….